The rise of social media has allowed brands to interact with consumers like never before. And because it’s possible, consumers expect it! They want brands to speak directly to them, taking their wants, needs and likes into consideration. The brands that do it well gain loyal customers. The key is consistency. How does your brand look? How does it react? How does it speak? 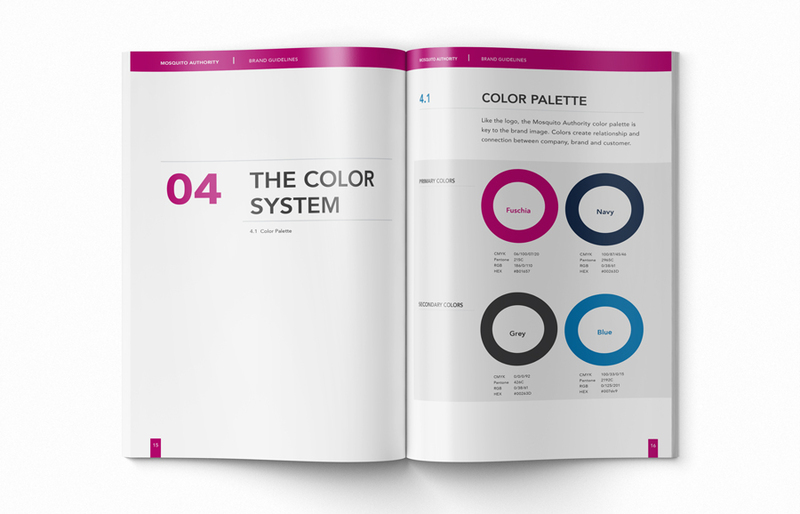 Detailed brand guidelines house the tools needed to communicate all of these attributes in a homogeneous manner; ensuring brand recognition across all marketing channels and empowering all stakeholders to become ambassadors of the brand. Whether you’re starting from the ground up, or have been in business for years, developing brand guidelines will add value to your business, simplify your process, and save you time. So, where to begin? Whether you’re fresh out of the gate or have a logo you love, but not much else, we’d love to get to know you! Learning about your business and what makes it stand out is our first step in strengthening your brand. We will analyze existing branding elements, and/or ideas, to determine what core components drive your business. These essential elements include your compelling idea (your purpose), voice/tone, consistency, sense of uniqueness, and market relevance. With the information gathered, we will partner with you to create a full visual suite and unique communication style that will drive results and elevate your marketing. 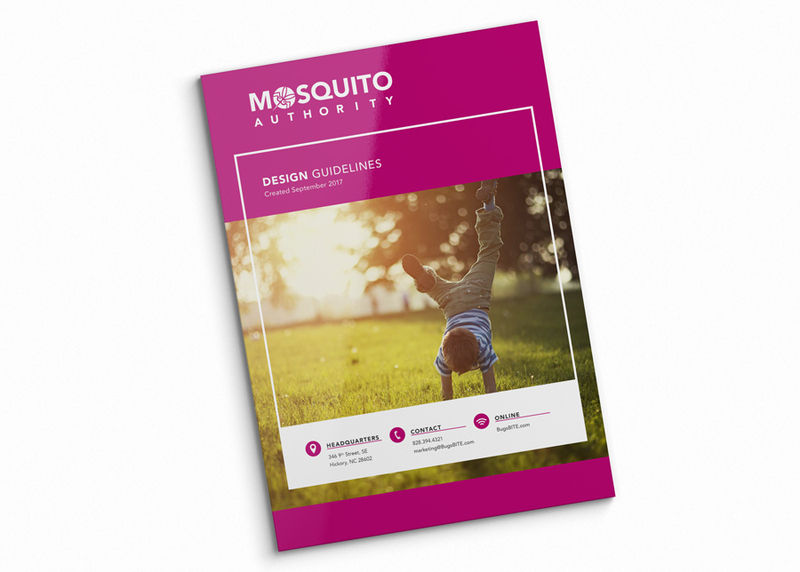 Below is a selection of layouts from the recently designed brand guidelines for Mosquito Authority. 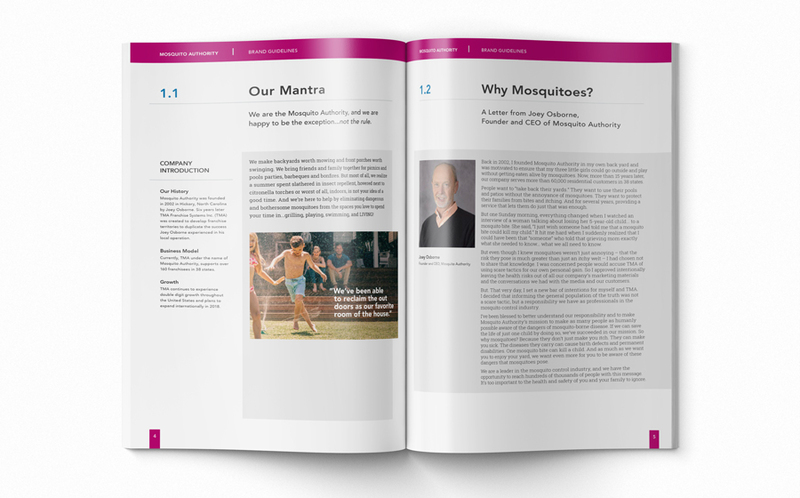 In this case, the client came to us with some brand elements they loved and we helped them build upon and refine their brand system.